A new air conditioning system means never having to say "I’m sorry." The good news there has never been a better time to purchase a new A/C system. United Heating & Plumbing has options for all budgets; from 13 SEER A/C systems through 18 SEER systems----and choices along the way. We have many options and estimates are always free so it’s a pretty painless process to investigate your options. We have 25 years installing A/C systems and we’ve helped thousands of people just like you. So, whether you’re a first-time home buyer or a seasoned homeowner (or investor) we’re likely to have an answer to your questions. In addition to selling and installing new A/C systems, we repair existing systems. Is your A/C on the fritz? We un-fritz units all the time, it’s a significant part of what we do. So whether you’re interested in a new A/C system that has seen better days or simply needing to repair an existing system, let United pull you out of an A/C jam. United Heating is a small, family owned and operated HVAC & Plumbing company that serves the entire Cincinnati and Dayton metro markets including Oakley, Centerville, Amberly Village, Mariemont, Oakwood, Madeira, Beavercreek, Indian Hill and Montgomery. Naturally, we’re State Licensed, bonded, and insured. Our State License number #22147. You need a new furnace. You know it. We know it. But help is on the way! If this is the year that you treat yourself to comfort, we can help you come up with a plan that meets your budget, Whether you’re a first-time homeowner, or seasoned investor, we can help you understand and plan the furnace or heating system that meets your needs. 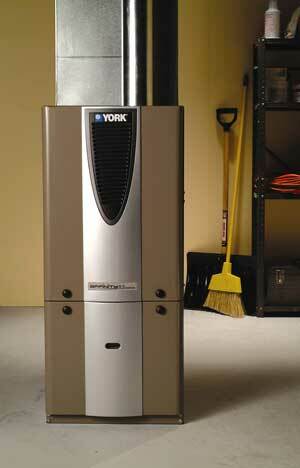 We’ve installed thousands of furnaces; from 80% models to a 98% by York. (the highest efficient furnace on the market) We install furnaces and A/C systems by York; a leading manufacturer and a division of Johnson Controls. (A Fortune 500 company) In addition to furnace installation, we service and repair furnaces and all types of HVAC systems. So perhaps you just need furnace repair. We do that. In fact, we service all brands So, from soup to nuts-----from furnace installation to simply furnace repair, we’d like to become your "go-to guy" (or gal !) You can count on our very best effort. We know heat pumps and have installed hundreds. Heat pumps are specialized machines and require specialized skills to properly install and maintain. United has the training and experience to whip your heat pump into shape. A poorly installed heat pump will not only die prematurely, but penalize you with higher utility bills in the meantime. Even if it’s education----what a heat pump is and how it works, and more importantly whether it’s the right choice for you, give United a call and we’ll be right out. This is not your grandfather’s HVAC system. Geothermal HVAC harnesses the earth’s energy to both heat and cool your home. (and with the right configuration can pre-heat your water!) So, in the summer your geothermal heat pump puts excess the heat in your home in the earth (which the earth readily accepts) and in the winter extracts heat from the earth to heat your home. It’s virtually a win-win. Now, of course, it’s just a bit more complex than that, however estimates are always free, and it just happens to be a topic we’re fond of. So whether your motivation is to be a better steward of this planet’s resources, or looking for a smaller utility bill,(or both!) you just might consider geothermal HVAC. So gave us a call and we’ll answer all your questions.